Heating and cooling account for nearly half of your home’s energy costs! A smart thermostat offers both automation and greater control over your home’s temperature and climate – control that could save you a bundle on your energy bill. Smart thermostats learn your schedule and preferences, making it easy to be energy efficient by letting the thermostat handle the dropping and raising of the home’s temperature while you come and go. If you’ve ever left the AC or heater running all day while you were out, you’ll appreciate the way a smart thermostat like the Nest Learning Thermostat can detect that you’ve gone. Your smart thermostat is like a window into your home – check the companion app while you’re away from home to see if the heat’s running (and at what temperature). Got a second home? A smart thermostat is a great way to confirm the place is running smoothly while you’re away. Coming home early from work? Heading home from the airport? Still in bed and just wish it was a bit warmer? If you’ve got your mobile device handy, you’ve got control of your thermostat! The Honeywell Wi-Fi Smart Thermostat and ecobee EB-STAT-02 support email alerts in the event of your home’s temperature falling or rising outside of your pre-determined range. If your thermostat is disconnected from its network, perhaps due to a power outage, you can be notified of that, too. Collect Nest Leafs for big savings. The whole point of a smart thermostat is to save you money on your heating and cooling bill by nudging you towards energy-saving settings. Depending on your current habits, letting the smart thermostat manage your home’s climate automatically could save you a bundle. The Nest Learning Thermostat encourages energy-saving choices by awarding “Leaf” badges and providing easy tips in the monthly energy reports for achieving even bigger energy savings. Our top rated smart thermostats are all easy to use, thanks to their modern screen designs and highly-rated companion apps. If you’ve had a hard time with programmable thermostats in the past, you’ll love this new generation of well-designed thermostats. 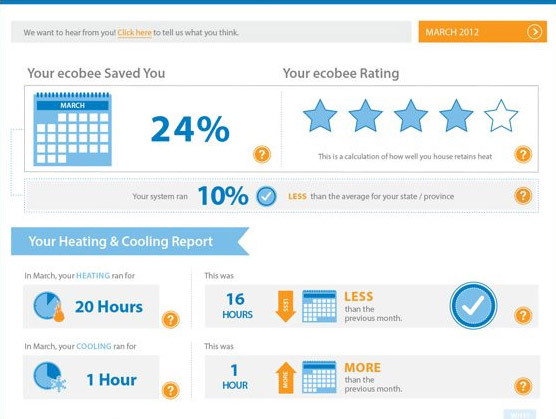 Nest and ecobee track your energy usage and show it to you in an easy-to-read monthly report. Curious about how much your heat ran last month? The report can tell you that. It can also tell you how much energy you used compared to other users, and reward you for using energy-efficient settings. Heading out for a while? Smart thermostats make it easy to set the temperature while you’re away without messing up your existing settings.